There are lots of games that make getting the lowest score the goal, but in Zero Down, hitting rock bottom is not only desirable; it is achievable. With just the right amount of skill and luck, perhaps you too can achieve nothing. 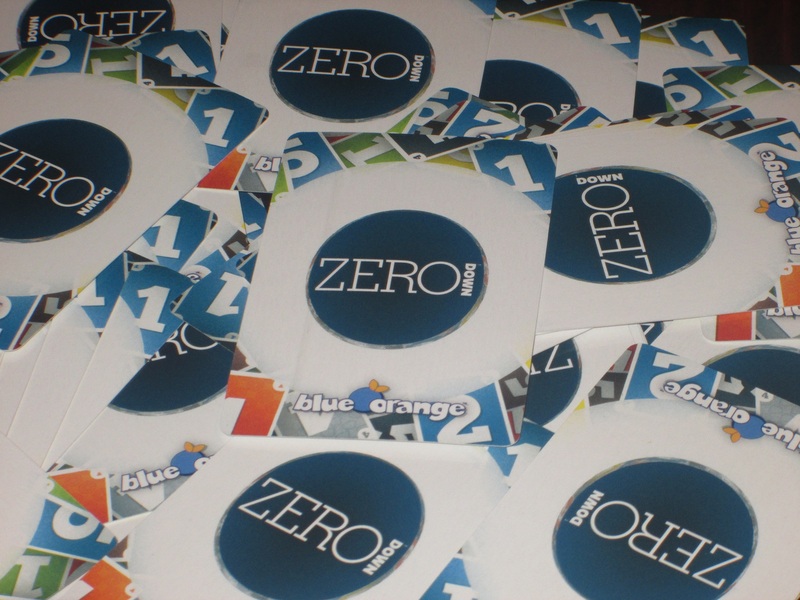 Zero Down is a set collection/hand management card game for two to five players. 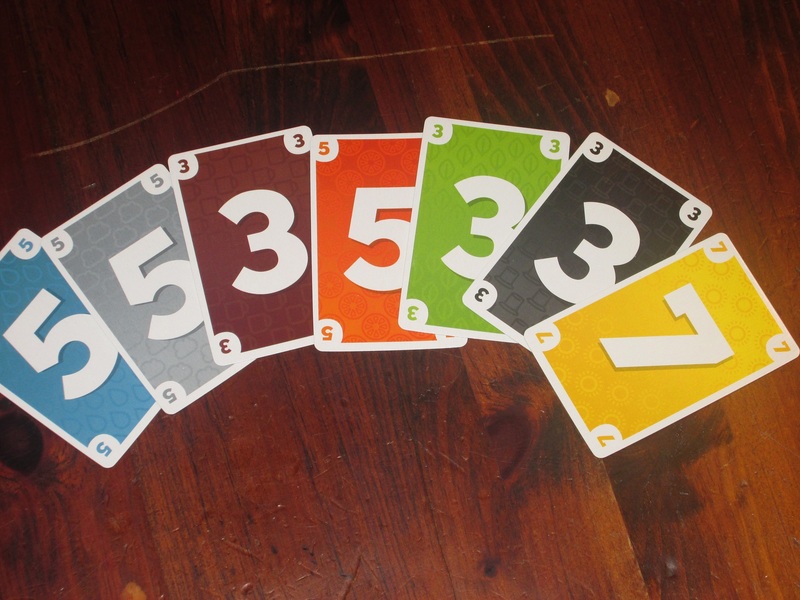 Players try to collect sets of the same number or same color to score the fewest points. The player with the fewest points wins. Zero Down set up for three players. To begin, shuffle the deck of cards. Each player is dealt nine cards, and five cards are placed face up in the center of the table. On a turn, a player may either swap a card from their hand with a card in the center of the table or “knock,” passing. Players are trying to collect sets of the same color or number. This hand is worth zero points. 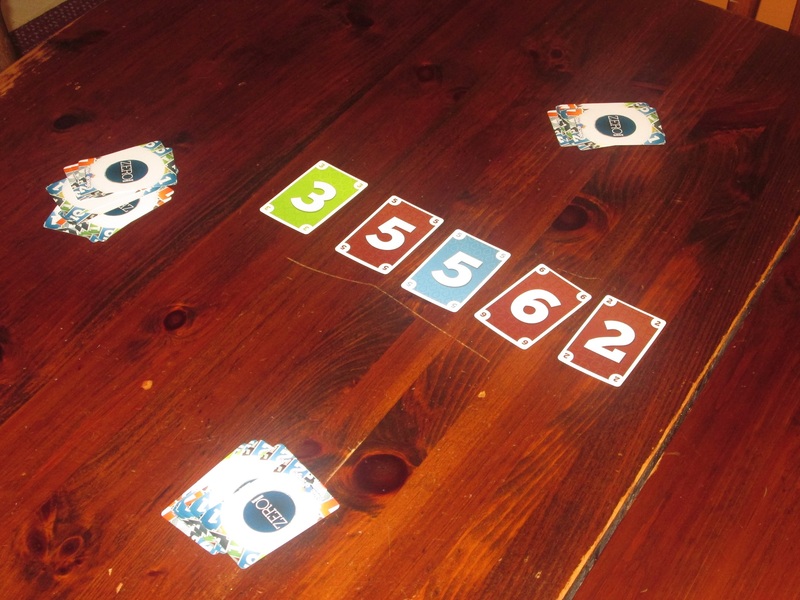 Score is kept from round to round, and the player with the fewest points after each player has been the dealer wins. No Problems, or Nothing There? I usually begin my reviews of Reiner Knizia’s card games by saying, “The rules made it look simple to the point of being simplistic, but…”–and then explain the interesting hook. In the case of Zero Down, I’m not sure that there’s the follow-up interesting hook, at least for hobbyists. But hobbyists aren’t really the target audience here. Zero Down is the kind of game that just about anyone should be able to pick up and play, and while the choices aren’t difficult, they are there, and they do affect the outcome. Zero Down is the kind of game that should work with casual (and even non-gamer) audiences, and it’s not a bad way to pass the time for hobbyists, as long as they don’t expect too much. The seven suits in Zero Down. The colors are vibrant and the numbers are easy to read. The simple binary of swap a card or pass is simple to explain, which is probably the biggest selling point of Zero Down. This isn’t the kind of game that players will misunderstand or need clarification for. Whether you are new to games or a seasoned veteran, everyone at the table should have the same comprehension of the game’s rules. 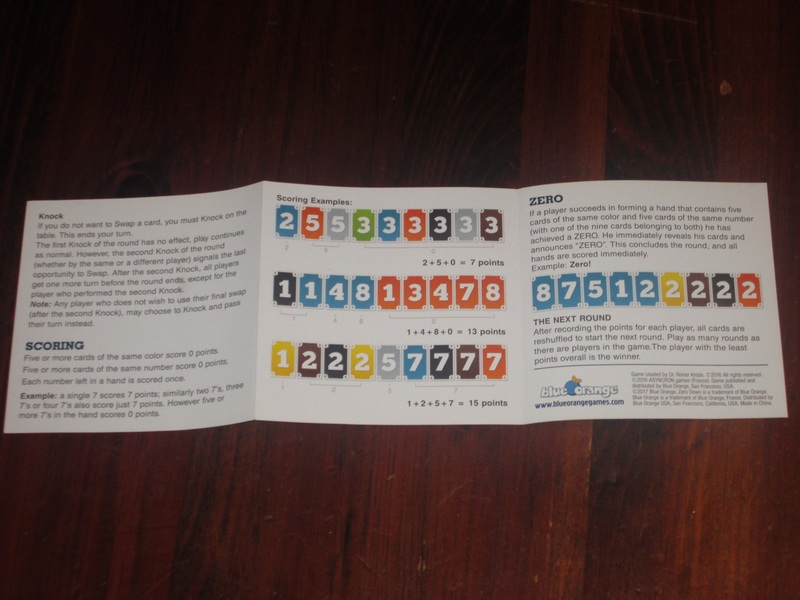 This is usually a hallmark of Reiner Knizia’s games, but in Zero Down, because the rules are even simpler than his other simple card games, you can reach that point faster. One of the players I introduced Zero Down to said it felt like the card games he grew up playing with his family, and I think that’s an apt comparison. There’s an almost mass-market appeal here, the kind of game you’d expect to find in any department store for an inexpensive night of fun with the family. Even though this game is different from Rummy and other Rummy derivatives, there’s something familiar here that, again, should be accommodating for just about anyone. The rules sheet is very short and also well illustrated. This game is super simple to explain. Yet despite its simplicity, there are at least some interesting decisions in the game. For one, the game is about getting the lowest score, and the scoring system incentivizes risk taking. 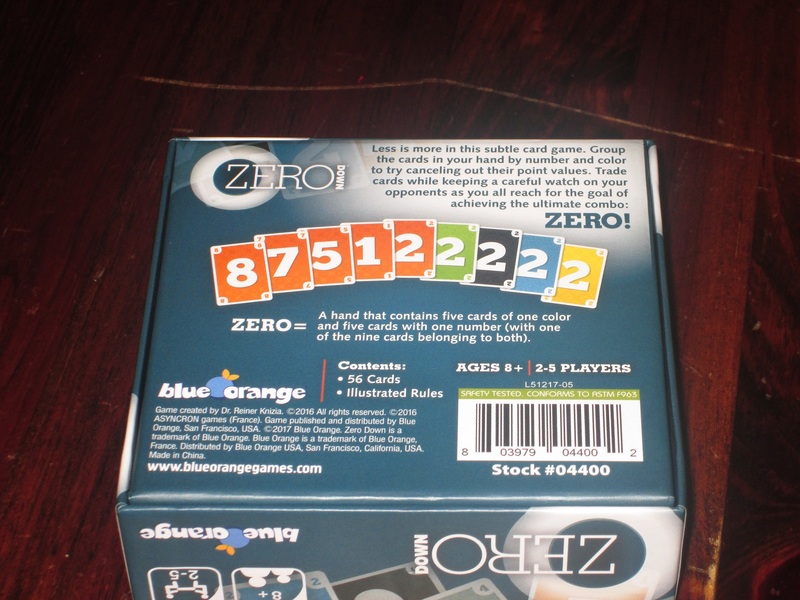 The only way to achieve zero is to collect both a set of numbers and a set of colors that overlaps at one point. And aside from achieving a null score, there is another benefit to getting zero: the round ends immediately, potentially sticking your opponents with cards they were hoping to shed had the round gone longer. But the risks of zero are also present. Collecting a set of one number isn’t so bad. 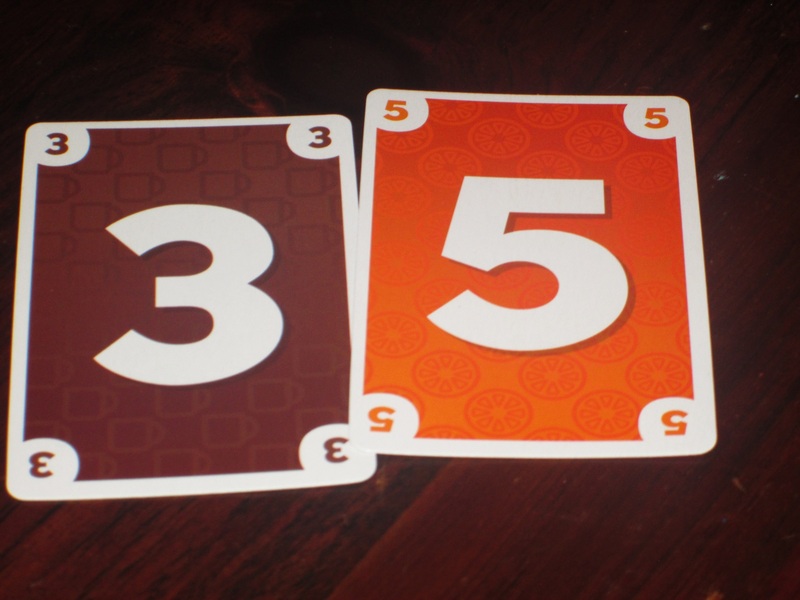 If you have four 5s, say, instead of five, you score just 5 points. But collecting a color is risky, because every number will score if you fail. There’s only one number of each color, so in order to collect a color you necessarily have to go broad. So going for a zero hand is dangerous. There’s also the consideration of knocking. In early games, players will probably knock because they have a decent hand that they think they can’t improve. In later games, players might knock not because their hand is awesome but because they think their hand is worth fewer points than their opponents’. By knocking early, you can limit the opportunities your opponents have to gain better cards. But in doing so, you’ll also limit your own opportunities. Each color has a different background illustration to make the game colorblind friendly. The idea that players could be collecting either color or number keeps the other players guessing, at least at the start of the game, what they’re after. 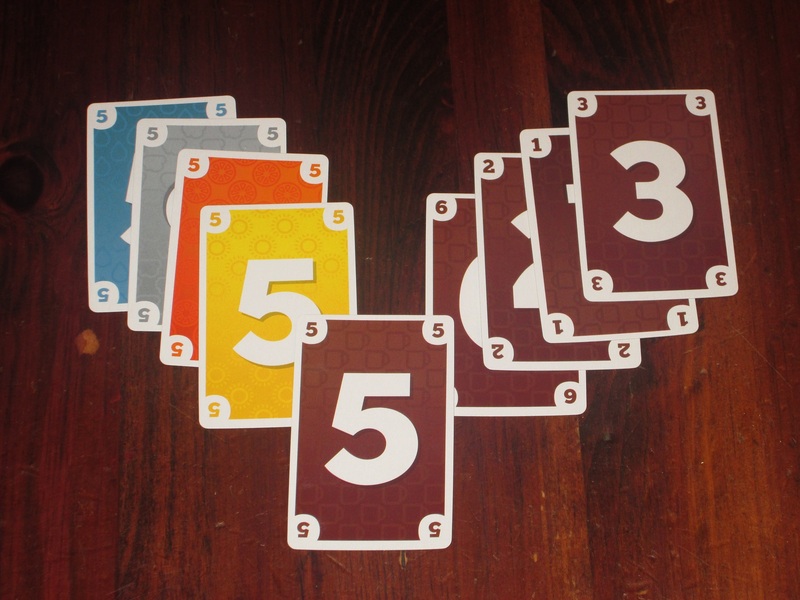 When you swap with the center, the other players are wondering, did you want that card because it’s brown or because it’s a 6? While this becomes increasingly clear as the round progresses, at the start, there’s little information. I like the gradual revelation that takes place over a round and the hope that develops that maybe, just maybe, another player will shed the card you need. I’ve mentioned that there are some interesting decisions here, but I don’t want to oversell this. There’s still a good deal of luck in the game. Sometimes the other players won’t discard what you need. Sometimes another player might just have a better hand than you. And sometimes the cards you think are in the game, the ones you need to collect to avoid scoring points, were set aside at the start with no possibility for you getting them at all. Obviously, these risks are known just by virtue of playing the game. But it does lower the tension of the decisions in the game. It’s easy to blame your losses on luck rather than on strategy when you can’t know for certain what your odds of doing well are. As such, Zero Down is certainly a casual card game. The design on the back of the cards. I’ve enjoyed my plays of Zero Down, but it does feel a little forgettable when compared with other card games. Reiner Knizia’s Circus Flohcati, for example, is similarly simple, but the push-your-luck mechanism in it makes for a more exciting game than Zero Down. (Of course, the flea artwork in the newest edition might deter some players.) For two players, both Lost Cities and Schotten-Totten have similarly slim rules but are much more strategic than Zero Down. (No cards are set aside.) Game of Trains is just a half-step up in difficulty from Rack-O, but the appealing train artwork is a pleasant addition to its simplicity. Zero Down is completely inoffensive and welcoming to literally anybody–there’s nothing to scare anyone off–but by being so smooth, it’s also not the kind of game I’m likely to reach for when showing off the best of what the hobby has to offer. That being said, the target audience for Zero Down is families who are looking for a simple, approachable game, and this will certainly fit the bill. I doubt this will disappoint, even if it doesn’t deliver memorable moments. The insert. The game is just 56 cards and a rules sheet, but it comes in a box that’s larger than the typical small-box card game. The components for Zero Down are serviceable. The cards have vibrant colors and are easy to read, and there are different symbols in the background of each color that should be helpful for colorblind players. I’m not a huge fan of the glossy finish, but this is a matter of taste; the build quality of the box and cards seems fine. The box is bigger than it needs to be, but it’s still a small box. The rulebook is clear. This is a simple, no-nonsense package for a simple, no-nonsense game. The package is not likely to thrill players, but it’s also not likely to distract or upset them. (Unlike, say, Circus Flohcati.) Knizia sometimes gets criticized for making games that are just numbers and colors, and with this package, well, it’s hard to disagree. Even though the box is bigger than it needs to be, it’s still decently small. Zero Down works fine with three through five players, but it is dull, dull, dull with two players. Enough cards are blindly removed from the deck that you never know what’s available, and it’s also not very interesting to pass cards back and forth, even if there are more cards revealed in the pool than in larger games. I suppose it might be better than nothing to play Zero Down with two, but there are so many other simple and excellent two-player games (even designed by Reiner Knizia) that I can’t in good conscience recommend this one for that player count. If you have more players at the table, though, this will work. The other writers for iSlaytheDragon sometimes tease me that every Knizia game gets a pass from me. 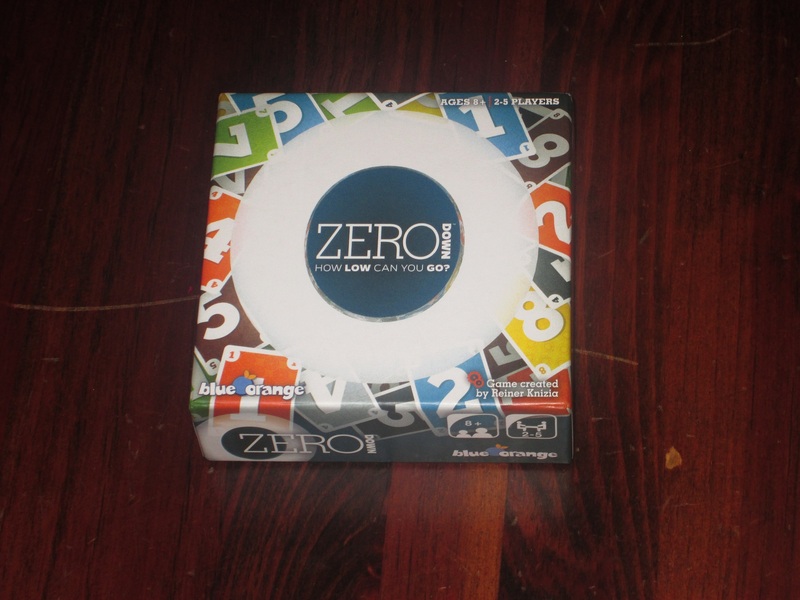 Zero Down is one of the few games of his that I’m not crazy about, yet even here, I don’t think Zero Down is bad; it just has limited applications for my circles. My family and friends are all into heavier games than this. Of course, I say this, but my fellow lunch gamers played this recently after our Isle of Skye game ended early, and everyone enjoyed it, one player even saying, “I like when there are good choices in games.” These are players who love much more complex games like Race for the Galaxy and Glory to Rome. So I might be selling Zero Down short. 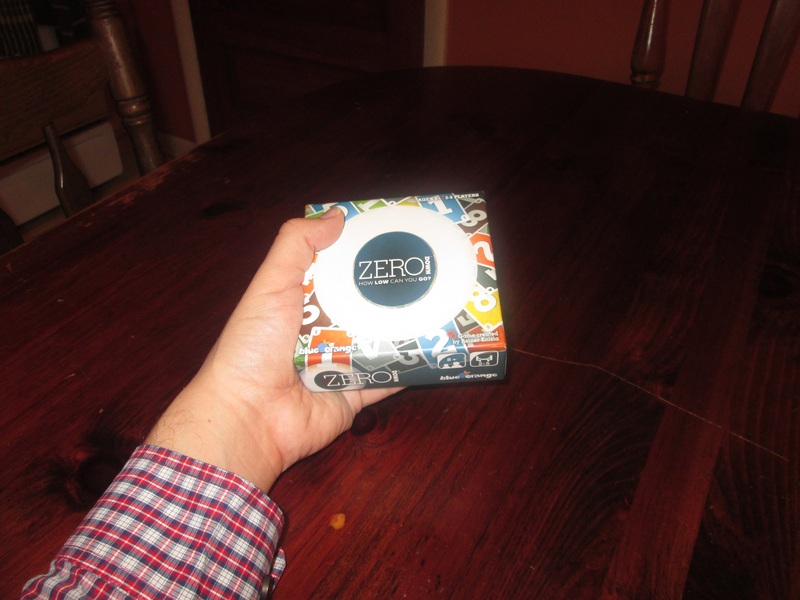 If you find yourself with a few minutes and not tons of brain power, Zero Down is, well, better than nothing. And if you find yourself among game-averse players, or in need of something to play with Grandma, or with your nieces and nephews, or if you need something to distract you from awkward conversations you’d rather not have but you want to be in the same room as somebody, you could do a lot worse than this game. There are likely better choices, but there are also much worse ones. 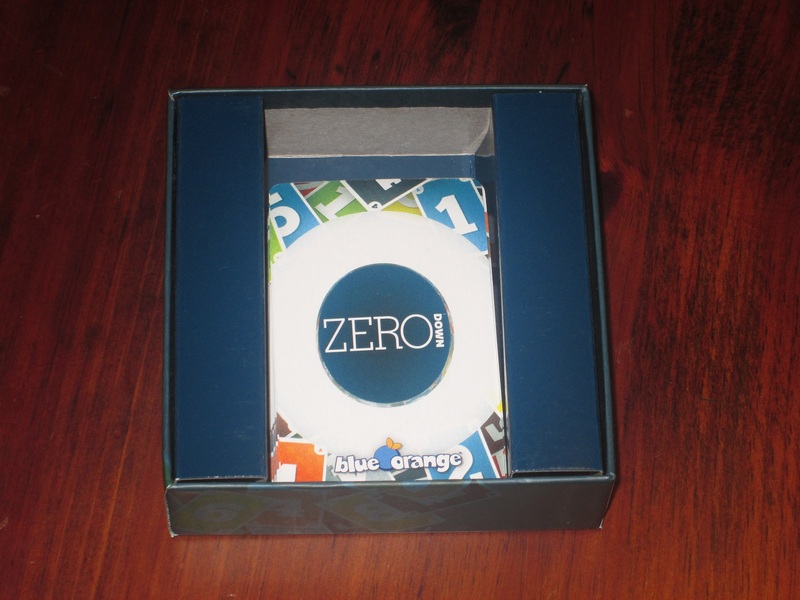 iSlaytheDragon would like to thank Blue Orange Games for providing us with a copy of Zero Down for review.